© Fondazione Fausto Melotti. Courtesy the Estate of Fausto Melotti and Hauser & Wirth. 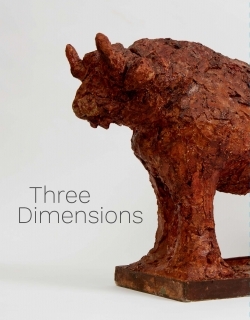 Acquavella Galleries is pleased to present a group exhibition, Three Dimensions: Modern and Contemporary Approaches to Relief and Sculpture, from September 25 – November 17, 2017. On view will be sculptural work in a variety of media, from cast bronzes by Edgar Degas and Henri Laurens, to ceramic works by Fausto Melotti, Pablo Picasso, and Joan Miró, a standing metal mobile by Alexander Calder, fabric works stitched by Louise Bourgeois and Claes Oldenburg, to Eva Hesse’s relief made of industrial materials and El Anatsui’s wall assemblage constructed of discarded newspaper plates. The exhibition will focus on twentieth and twenty-first century work, representing seminal artists from across Europe, the United States, South America, and West Africa. Works on view will explore several key ideas in modern and contemporary sculptural practice, such as the exploration of unorthodox materials, new choices in subject matter, and the dissolution of the boundary between painting and sculpture.